My very first trip abroad in 1969 was by train from London to Porto, via Newhaven, ferry to Dieppe, train to Paris, bus across Paris, onwards by train to Hendaye, Irun, Salamanca, Fuentes de Oñoro, Pampilhosa and Aveiro in order to sample the steamy delights of the Douro Valley (Port wine country!) and it was quite an adventure - no easyJet in those days! It took three days to get there, including an overnight run across France, a day in Spain for photography and another overnight trip to Porto. It was well worth it and I repeated the trip exactly a year later. Photos are in chronological order, oldest first - more will be added as time permits. I will upload photos from 1969 when time permits.... Photos are taken with my first SLR camera, a Pentax S1a using a variety of prime lenses. Metering by Weston Master V and the majority of the pictures are on Agfa CT18 film, just a few on High Speed Ektachrome, which was all of 160asa! I have also managed to collect a number of original slides which pre-date my own visits and fill in some gaps, these are mainly on Kodachrome film, I hope you will enjoy these too! After starting away again from Carrazedo station, E205 is climbing around the many curves to gain height as it heads for Cruzeiro and Vila Real, en route with the 10:21 train from Régua to Chaves. Thursday 5th November 1970. Slide No. 5798. Me he caído con todo el artesonado.No tenía ni idea de que las Pacific tunecinas del Ferrocarril de La Robla llegaron a tener color verde en su totalidad. Beautiful collection of ancient photos of our railroad .In the Fotopic had this collection and with great success .Bem has because of spreading these photos, which in these modern times, we have not for here. Mr. Plumb should be awarded an honorary portuguese citizenship. 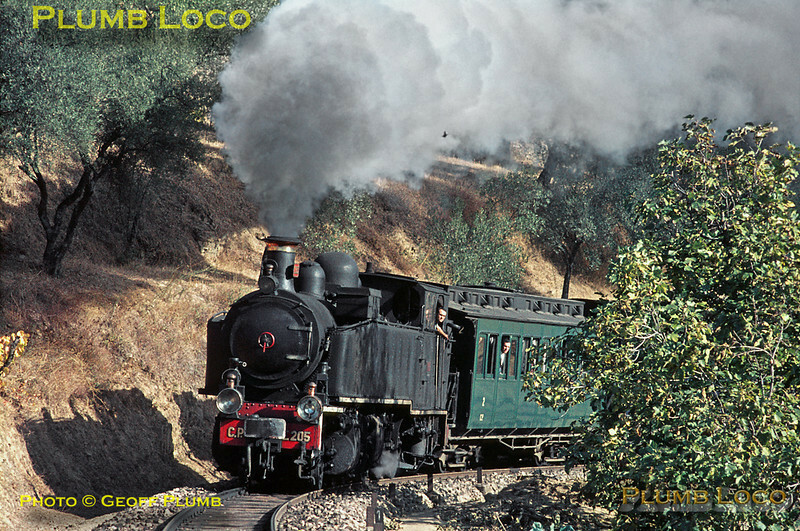 Your slides (and your friends') are amongst the best records available of the late steam/ early diesel era in Portugal. Highly commended collection!